This FREE Monthly Household Budget Spreadsheet will help you create your own, personal budget. 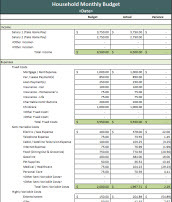 The spreadsheet separates common expenses into fixed and variable. Once you have your budget created, you can also use the spreadsheet to compare your actual income and expenses to your budget. Creating a budget is an excellent way to reduce debt, analyze expenses, or plan for future purchases. When creating your budget, try to keep your total expenses less than 90% of your salary. This will reserve 10% of your salary for things such as savings or unexpected expenses.